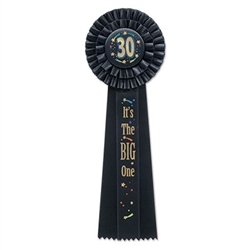 Let everyone know that turning 30 is not a bad thing, instead make it a wonderful birthday by proudly wearing the 30 It’s The Big One Deluxe Ribbon. The Rosette Ribbon is a beautiful wearable to be worn by the person celebrating their milestone birthday. The Deluxe Rosette Ribbon is decorated with hanging ribbons and shooting stars. The middle of the ribbon is a round button that is printed in gold lettering and reads 30. Printed on the hanging ribbon is the gold lettering reading It’s The Big One. The 30 It's The Big One Deluxe Rosette Ribbon has an attached pin that can be used to attach to material. Use the Bright and Bold 30 Candle to decorate a birthday cake.